Sometimes it doesn’t take much to be called a bigot. To see a human fetus as having moral value and a claim upon our consciences, for instance, can be classified as “hating women.” Which might be great for eliciting contributions from some quarters, but not so great for increasing understanding across the gulf of disagreement. If we’re to have civil conversations in our society, conversations with some hope of leading toward synthesis, toward solutions, “hate” is a word we need to be careful with. But in recent days, that word has seemed more and more like precisely the right one to explain the way some of our fellow citizens regard what is going on down on our border. What we’re seeing now, and what we’re hearing from the people who defend Trump’s actions, pretty much does seem to be… hatred. I’ve been marveling over this for years. I guess it was the early 2000s when we started seeing this surge of anger toward people who came here to pick crops, do back-breaking construction, or work in the stench of a chicken-processing plant. It’s the ANGER that amazes me. The folks who say those things are furious, apoplectic that these people from the South cross a line in the desert without the proper paperwork. What is it about that bureaucratic lapse, that misdemeanor committed by some migrants, that stirs such anger? And I’m not even getting into the fact that this attitude goes beyond illegality, and has increasingly taken the form of wanting to decrease legal immigration. This entry was posted in Immigration, Words on June 23, 2018 by Brad Warthen. What makes her think anyone would want to vote for someone who calls herself a “buzzsaw” — whose entire public persona is about being as destructive as possible? What is wrong with such people? 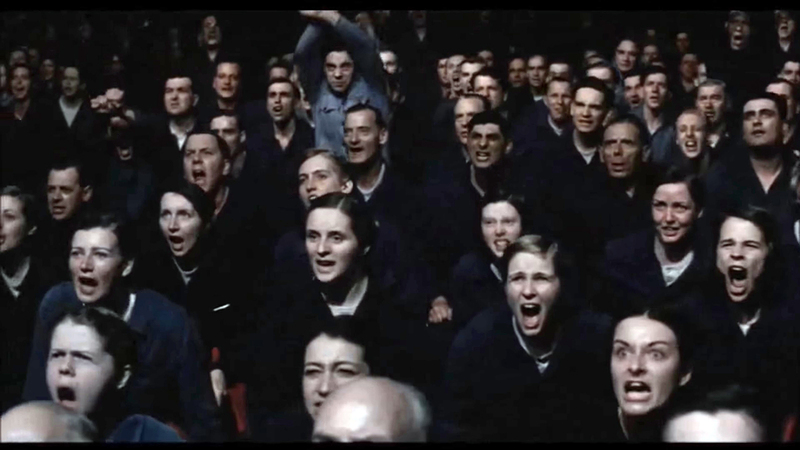 Are they just nihilists — do they simply want to “blow s__t up?” Do they really, truly not want to see people they vote for accomplish anything positive at all — just rend and destroy? 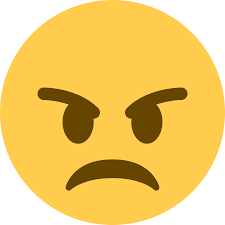 Could people who want that please take a break from voting? Because I think they’re why we have a lot of the problems we have in this country. Ever since we started electing people to run government whose main message was that they HATE government, things have been on a downward slide. When the Toby Maguire version of “Spider-Man” came along, people understood that a character who called himself “Bonesaw” was a character to be avoided. “Buzzsaw” isn’t that far off in terms of imagery (just less anatomical). What has happened to people’s common sense since then? Oh, and must we even get into the fairly obvious fact that the words “conservative” and “buzzsaw” do not go together? That phrase is a contradiction in terms. Conservative people wish to conserve, not destroy. 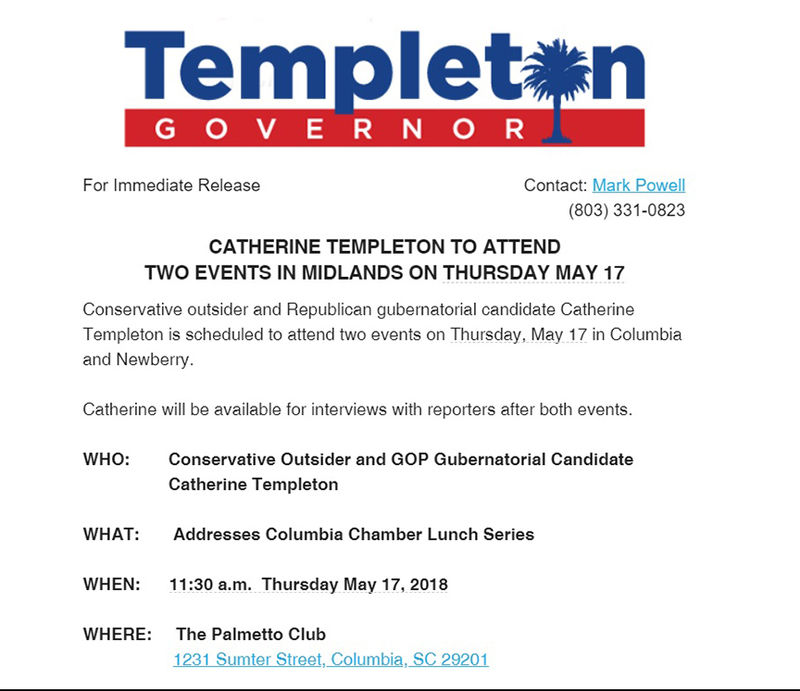 This entry was posted in 2018 Governor, Catherine Templeton, Words on May 2, 2018 by Brad Warthen. 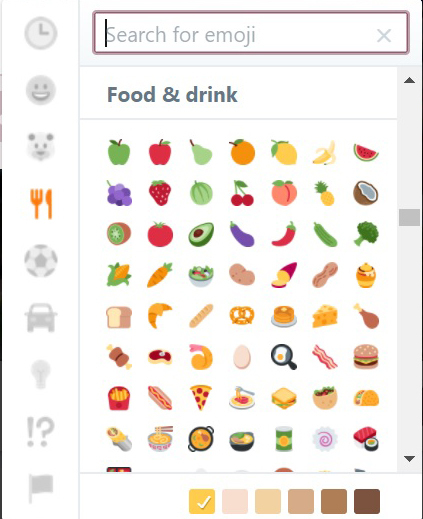 Of course, I meant “emoji,” because I wasn’t just talking about faces. I had thought “emoji” was just the cutesy shortening of “emoticon” — and my purpose was to wage war on cutesiness — but Wikipedia said not to confuse them. 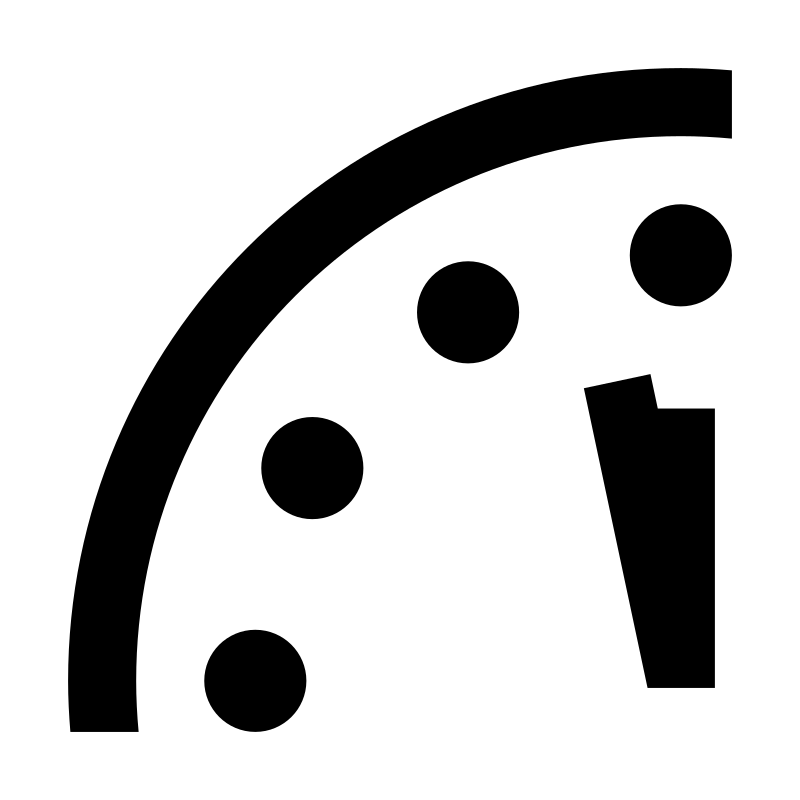 Years ago, I read an article about how Umberto Eco — the semiotician who is best known as the author of The Name of the Rose — was predicting the advent of a post-literate society. This was a couple of decades ago, long before emojis. I seem to remember him talking about the Medieval days when, say, a pub called “The Fox and Hound” would mark itself with images of those animals instead of words, since the proprietor knew most prospective patrons would be illiterate. Eco predicted we were headed back toward that darkness. 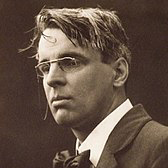 Lately, we hear regularly about the post-literate world that’s coming into being. 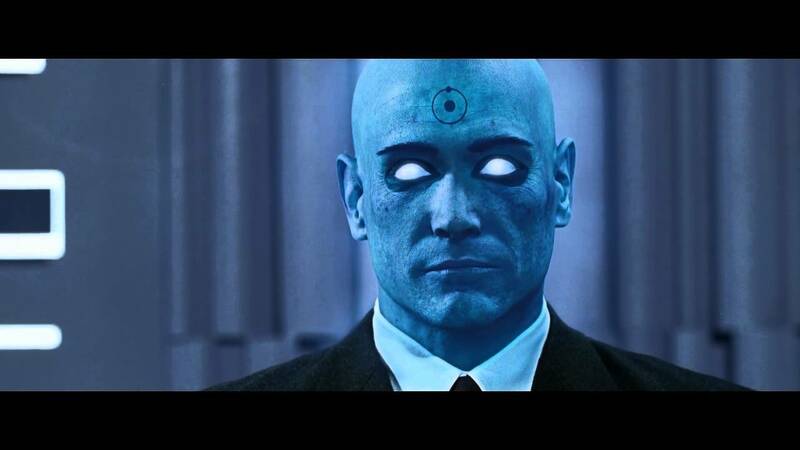 Increasingly, our devices respond to voice and facial recognition more than typed input. This entry was posted in In Our Time, Marketplace of ideas, Peeves, Social media, Words on March 19, 2018 by Brad Warthen. No doubt some will cite this as evidence that my Ménière’s has reached the point at which I need a hearing aid. But in my defense, my wife was out in the hallway when she said this, and I was in the bathroom with the exhaust fan running — although the door, I admit, was open. Anyway, she had come upstairs to tell me that her youngest brother was on his way to the St. Patrick’s Day parade in Memphis (my wife’s family, the Phelans, are real Irish Catholics, not pretenders like me), and that he had told her something alarming about that parade. She said the people on the floats throw catechisms to the crowd. At least, I thought that’s what she said. I considered it a bit odd — most such parades aren’t that, shall we say, holy — but nevertheless arguably appropriate, since St. Patrick converted the heathen Irish to Christianity. Then she said other things that made me wonder. I asked her to repeat the first thing she’d said. 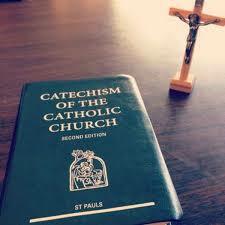 This time, I thought she said they were throwing “catechists,” and that did sound dangerous. If you go throwing people, religious education teachers, off of floats, someone could get hurt. But something about this version sounded even more suspicious, so I finally asked her directly whether she had indeed said they were throwing catechisms or catechists. She roared with laughter at this point (which frankly I don’t think is the kindest way to deal with my affliction). 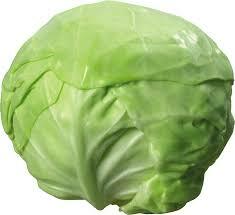 She had been saying, “cabbages.” They were throwing cabbages from the floats. Yeah, OK. That could be dangerous. Look out! What’s that they’re throwing? 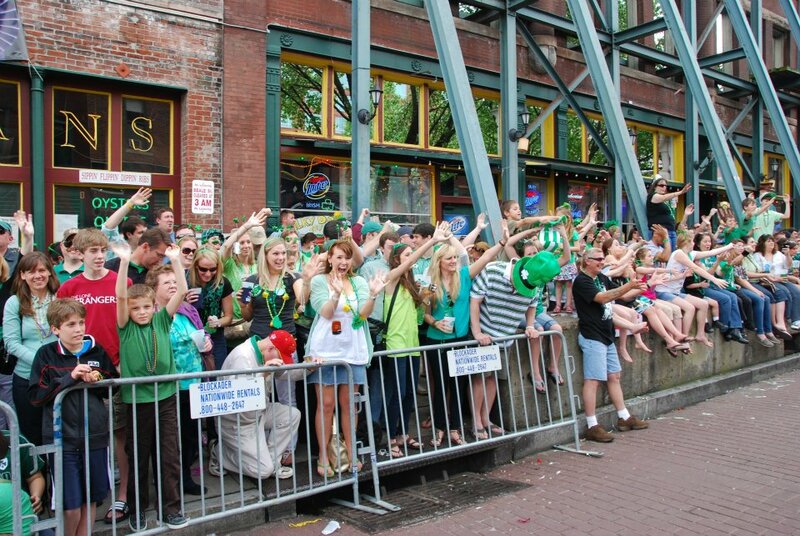 The St. Patrick’s Day parade on Beale Street. This entry was posted in Confessional, Doh!, Faith, Holidays, Personal, Words on March 17, 2018 by Brad Warthen. Not much of a challenge, is it? You just pick the one that reads like it came from a child who’s trying to sound grownup but not succeeding. Or perhaps from someone whose first language is not English, and who knows next to nothing about religion or Western culture in general. The others, the ones that sound like they came from articulate grownups, are from Lindsey Graham, Mike Pence, former George H.W. Bush and Mitt Romney. This entry was posted in Character, Donald Trump, Words on February 21, 2018 by Brad Warthen. Some of my liberal friends here are constantly on my case for what they call my “false equivalence.” They believe they are not contributing to the careening, irrational polarization of our era — it’s the extremists on the other side who are entirely to blame. Which, of course, isn’t true. Yep, the Republicans (or a lot of them) have been getting weirder and weirder in recent years, but there are plenty of people on the left who are happy to keep pushing them away. 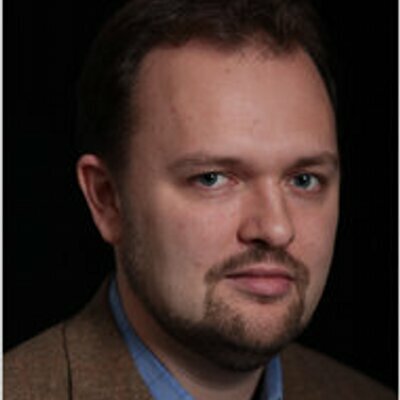 Conservative columnist Ross Douthat of The New York Times wrote a provocative column a day or two back. Basically the thrust of it was this: As objectionable as Stephen Miller is, maybe he needs to be at the table if a viable immigration compromise is to be reached. For years, we’ve tried fashioning a comprehensive solution without the nativists at the table, and nothing has passed. Maybe it’s time to try something else. And there are various reasonable grounds on which one might favor a reduction. The foreign-born share of the U.S. population is near a record high, and increased diversity and the distrust it sows have clearly put stresses on our politics. There are questions about how fast the recent wave of low-skilled immigrants is assimilating, evidence that constant new immigration makes it harder for earlier arrivals to advance, and reasons to think that a native working class gripped by social crisis might benefit from a little less wage competition for a while. California, the model for a high-immigration future, is prosperous and dynamic — but also increasingly stratified by race, with the same inequality-measuring Gini coefficient as Honduras…. With that said, illegal immigration has slowed over the last decade, and immigration’s potential economic and humanitarian benefits are still considerable. And it’s also clear that many immigration restrictionists are influenced by simple bigotry — with the president’s recent excrement-related remarks a noteworthy illustration. … which leads to Douthat’s point that doing so hasn’t worked; maybe actually negotiating with these people could. Overall, I consider Miller and what he wants to do beyond the pale, because of the ugly nativism that animates the anti-immigrant position (and yes, in this case we’re talking anti-immigrant, not just anti-illegal immigrant). What he wants to achieve shouldn’t be dignified with serious consideration. But it doesn’t make you a racist or a fan of racism to suggest that he should be let into the conversation. And saying, in no uncertain terms, that it does is itself an example of the kind of extremism that’s driven our country apart. This entry was posted in Civility, Immigration, Marketplace of ideas, Polarization, The Nation, Words on January 30, 2018 by Brad Warthen. One person especially critical on Sunday night was a member of the Trump Administration and took to Twitter to voice their displeasure. No, it wasn’t President Donald Trump. “Their?” To voice their displeasure? 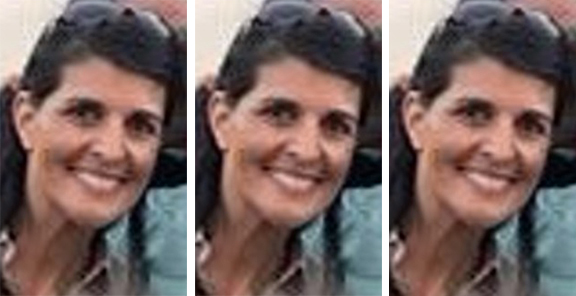 See how easy that was — and how much better than creating a universe in which there are multiple Nikki Haleys? 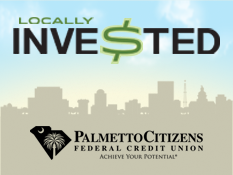 This entry was posted in Media, Nikki Haley, Social media, Words on January 29, 2018 by Brad Warthen. 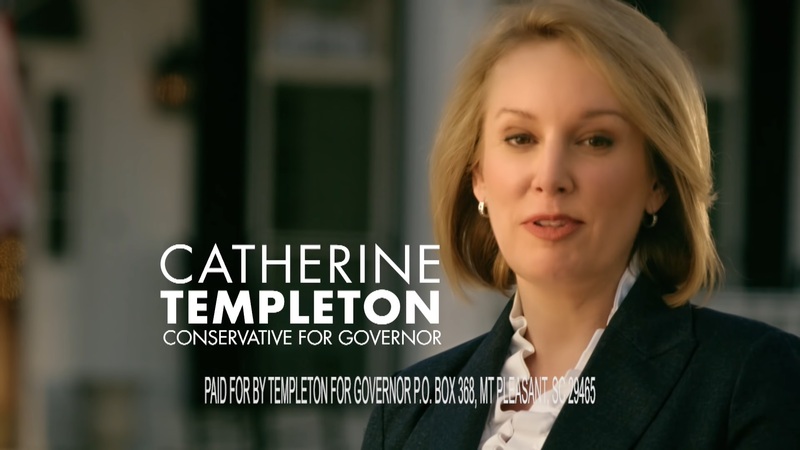 Apparently, Catherine Templeton has changed her name. Which is weird. I mean, once you say all that mouthful, you’re about out of room for a normal headline, and you still haven’t gotten to a verb. Consequently, when I see a release from her, I think I’m seeing the same one — but no, eventually I get to a word that’s different. It just takes patience. Actually, I just looked again and realized the part that doesn’t vary a whit is longer than I initially thought. 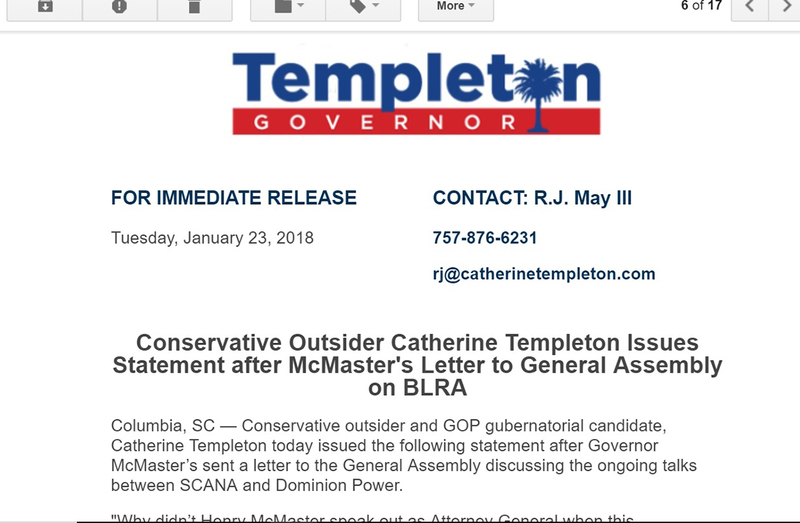 With these two examples, the release starts “Conservative Outsider Catherine Templeton Issues Statement” before it gets to a single word that varies. This is an odd communication style. Usually, writers of releases seek to engage your attention way sooner. But the campaign seems to have decided that positioning her as “Conservative Outsider” is more important than actually saying something — more important even than her name. 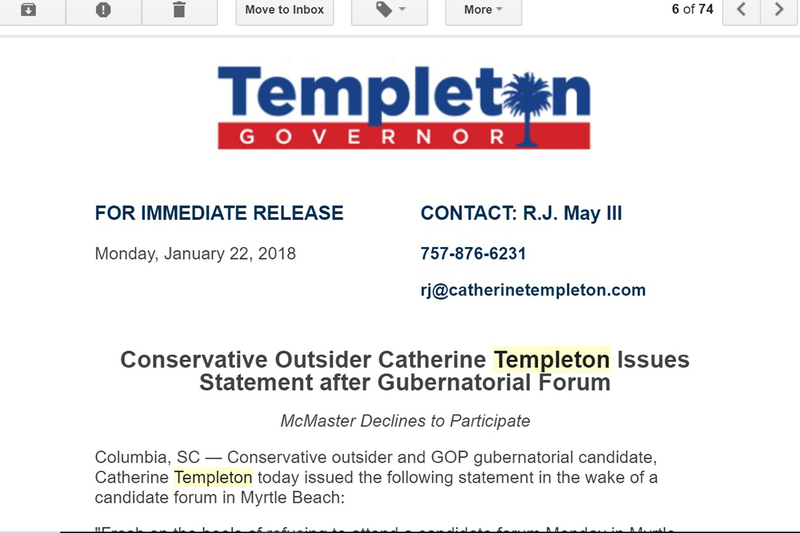 Maybe going forward, they could abbreviate it to something like “ConOut Templeton…,” in the interest of moving things along and getting to the point. 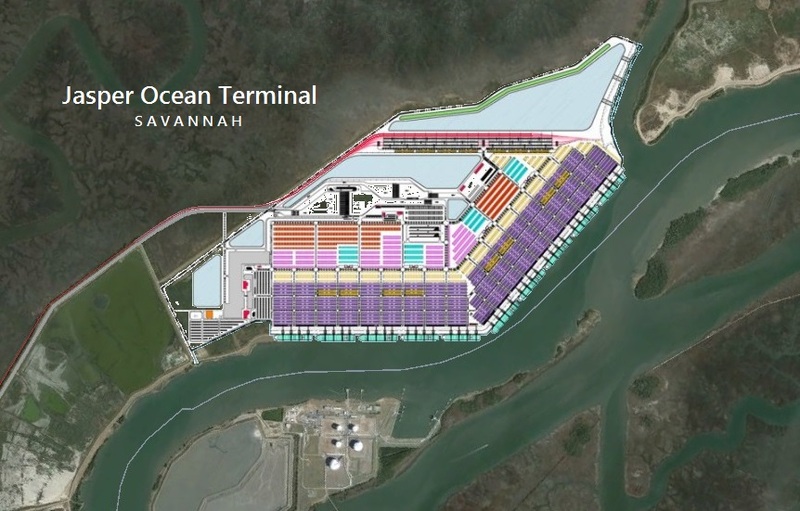 This entry was posted in 2018 Governor, Republicans, South Carolina, Words on January 24, 2018 by Brad Warthen. Bud, get ready to duck, because this has to do with abortion, at least tangentially. In fact, I’ve got another couple of post ideas that do the same. You might want to sit these out, since it bugs you when the topic comes up. 45 years ago, the Supreme Court handed down one of their most powerful decisions in Roe v Wade, codifying a woman’s right to access a legal abortion in the United States. You’d think that would have settled the matter — but extremists have been trying to strip women of this basic reproductive right ever since…. 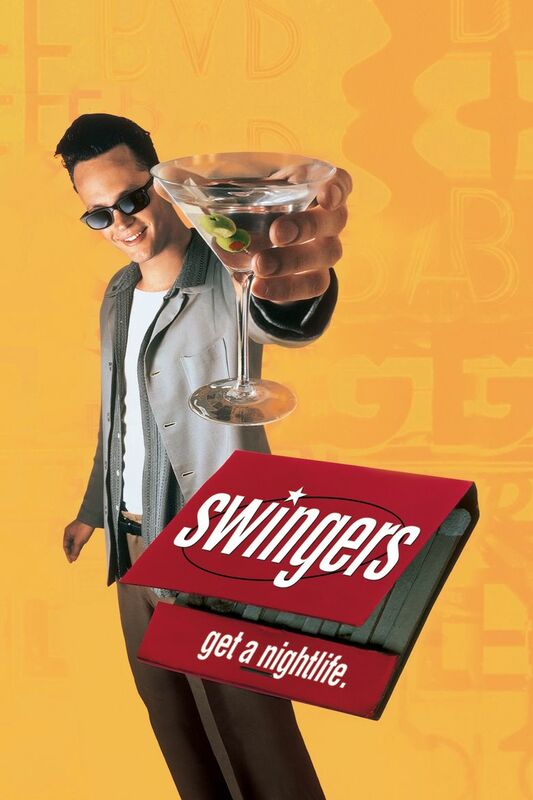 But never mind me, and never mind abortion. This is not about me. 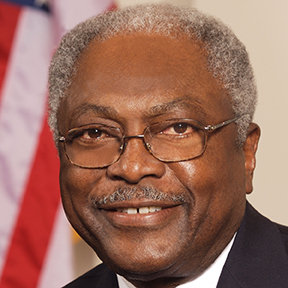 It’s not even about Jim Clyburn. It’s about the fact that this is the way people in both parties in Washington speak about people who disagree with them. 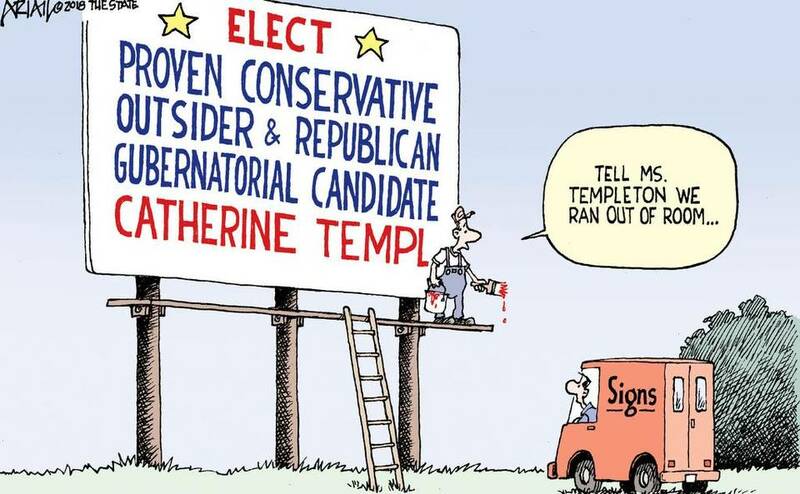 Lord knows the Republicans do it. And this is one of the ways that Democrats do it. They appeal to their hyperpartisan bases by using language that delegitimizes people who disagree. I try not to do this (I may fail, but I try). You know why? Because I have lots of friends — earnest, thoughtful people — who disagree with me on this issue. For the most part, I avoid talking with them about this. But when we do discuss it, I try to be respectful. And you know what? I’ll bet that in a one-on-one conversation with a constituent, Jim Clyburn would try to do the same. This entry was posted in Abortion, Civility, Words on January 23, 2018 by Brad Warthen. You were there, Senator. So what did the president say, and how did he say it? Trouble is, his original story remains vague and indirect. He seems to want to have his cake and eat it, too — to call the president out for his racist assertions without quite, you know, calling him out. “I tried to make it very clear to the president that when you say ‘I’m an American,’ what does that mean?” Graham said. “It doesn’t mean that they’re black or white, rich or poor. It means that you buy into an ideal of self-representation, compassion, tolerance, the ability to practice one’s religion without interference and the acceptance of those who are different. Agreed, senator. But since people are standing up and saying Trump didn’t say what he said, it would be helpful if you’d be the truthteller and give us a precise account of what you heard. As the late Howard Baker might have said, What did the president say, and how did he say it? 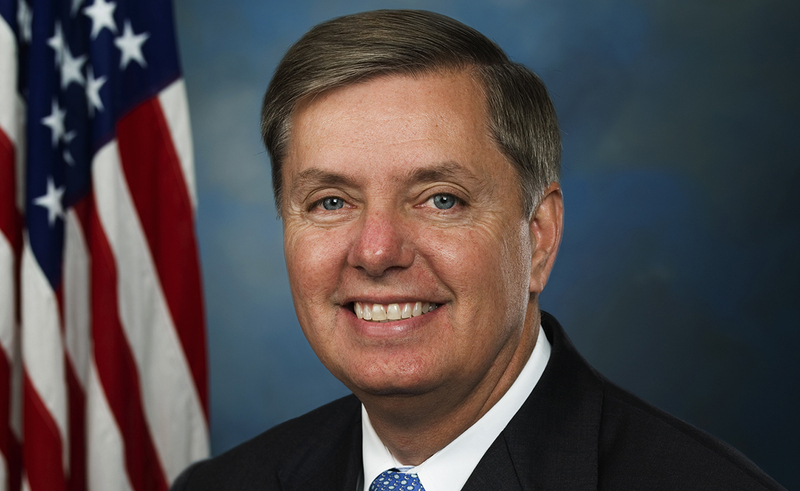 This entry was posted in Character, Donald Trump, Immigration, Lindsey Graham, Race, The Nation, The World, Words on January 16, 2018 by Brad Warthen.